Olympus have produced a really nice camera in the SP-810UZ. The user interface is easy to understand and navigate, the LCD screen is clear and bright and the menu system isn't too exhausting. On the build side, it's not sparkling - it looks nice and has a lot of shiny plastic but that soon starts to wear. The Olympus SP-810UZ's biggest selling point is obviously its zoom range - 36x is simply mind boggling. Take a look at the zoom sample on Page 2, it's difficult to see the church spire in the wide angle shot. We're also impressed with how sharp the pictures are, even with noise in them. We zoomed fully out to get a shot of the moon and got a sharp image hand-held on a late January afternoon. Where the moon starts to go dark, all the craters on its pitted surface can be made out. At 14 megapixels, the SP-810UZ doesn't sport the highest resolution but it's certainly high enough for most people's needs. Even at the highest setting, we still found that images are relatively small and on a 1Gb card, we had plenty of space, enough for a day out with the family. We like the brightness of the LCD screen which is good because there's no viewfinder even though this is a superzoom and as such they usually have at least an electronic version. We find a viewfinder helps to focus on what's happening in the picture without any distractions in our peripheral vision. Still, even though we had our reservations, we managed to get plenty of sharp pictures even at full zoom and hand-held. 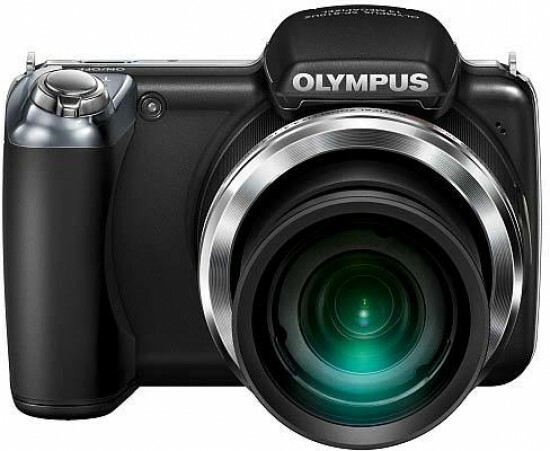 The Olympus SP-810UZ is a moderately priced camera at around the £200 / $300 mark. This brings it into the most popular price bracket for amateur and happy-snapper consumers. If you're looking for a new point and shoot digital compact camera with a typical £200-250 budget but you still want something out of the ordinary, then the Olympus SP-810UZ more than fits the bill.